My poor executive functioning skills really stand out this time of the year. I can barely decide what to eat on a menu and now I have to pick my favorite toys? If you follow Toys Are Tools then you know that I love everything reviewed here. But no one has the money or space to buy everything available and so to support your thoughtful holiday shopping this year, here is a list of things that have left a lasting impression on us. Best Play Invention of the Year: Woodmobiel Standard Kit distributed by OOTS! 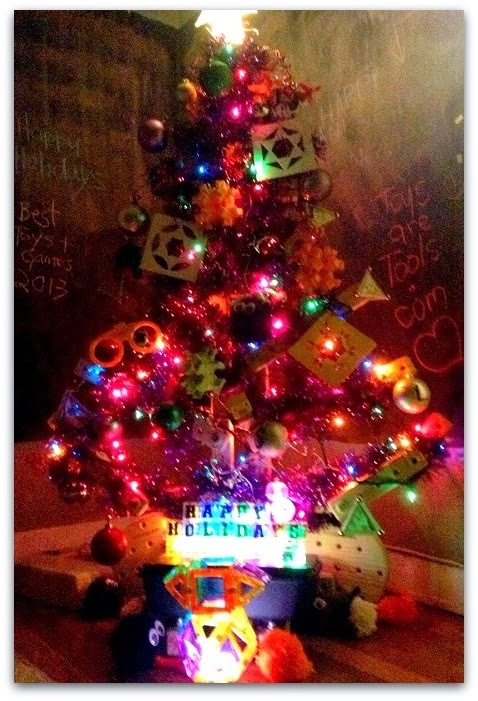 Megan, I finally did finish that Christmas Tree- Thanks for your question about Woodmobiel's longevity. I wrote Megan back saying YES! And here is another clue that makes me feel like I did a great thing. 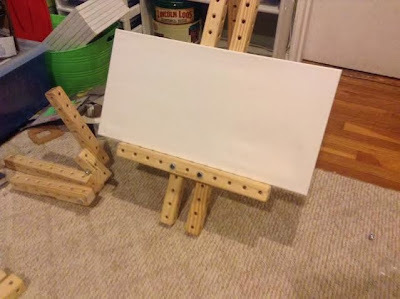 My son built an easel for his little brother. It may look simple to you but it folds flat and is sturdy -I put little foam tabs on the bottom. Additionally, there are many pieces left over so that we can build more stuff! 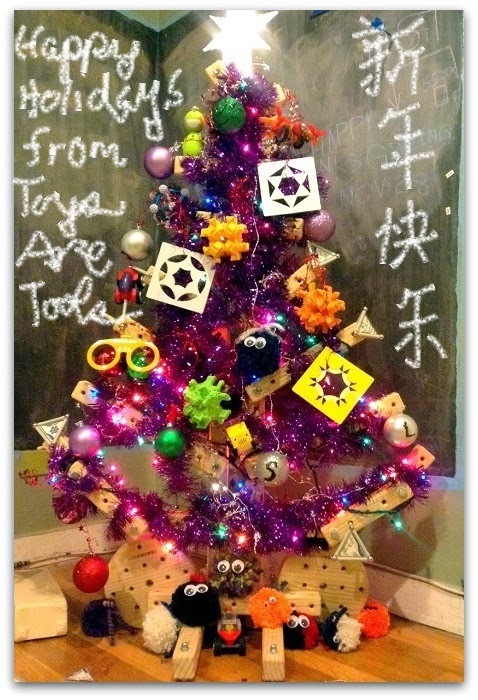 Like our holiday tree! If you happen to have active kids at home. 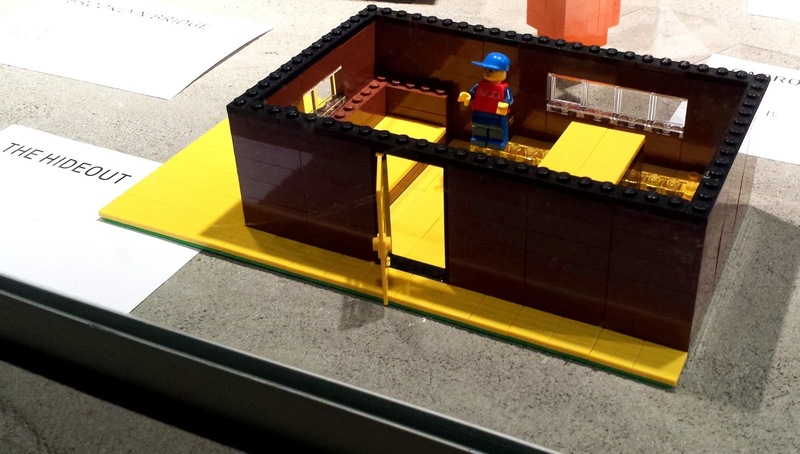 Why not challenge them to build something that will build their brains AND muscles? We never buy our kids easels after age 3, am I right? I think we should change that. I credit Woodmobiel for allowing my son to invent while he plays. I think I make my point, yes? To me, this year's Best Play Invention of the Year is the toy that is used to make fun things that can make even more fun things. You can use it for a limitless variety of play. To me, this is the practical toy, the toy that saves you money and yet meets your goals. Here is what educational expert, David Wells, Director of Creative Making and Learning at the New York Hall of Science said about Woodmobiel regarding life-sized building toys. "It's a lot different to build a bike and put a doll on it," David explained. "When you're sitting on something, there's a whole sense of pride that goes along with something you've made that you use in your everyday life." Read my full review of Woodmobiel here. all pictures have a consistent "ye olde" look about them so that you can't easily discern its place in time. This game is currently the big craze in our home. We are big-time history geeks here and we're very greedy to amass lots of knowledge nuggets. In short, we are a family of Cliff Clavins. But seriously, we love this game. 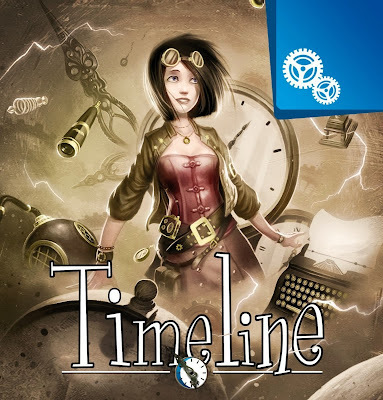 We haven't reviewed this yet but please know that we love it so much that we just bought sister games Timeline: Historical Events and Cardline: Animals. (and there are more). You don't have to know when the friction match was invented but just try to figure out where it falls on the timeline. Additionally, while there is a winner, no one has to be head-to-head looking at each other. Instead, it's more like a video game, they look at the same thing together. Timeline gets an A+ for Anxiety Antidote! 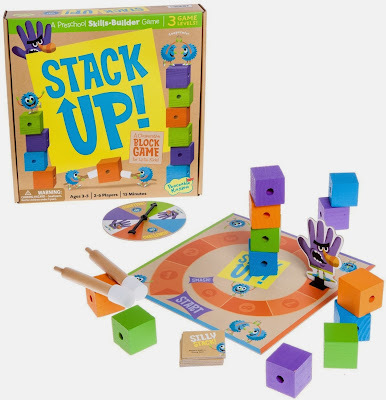 Best Game for Preschoolers and Kindies: a tie between Stack Up! and Camelot Jr.
Give an occupational therapist a paper clip and they can tell you right away at least five ways that you can use it to help children improve their skills. But what if you are not a therapist and you want to work on your kids' fine motor skills without making them do stuff that some kids hate to do... uh.. like... handwriting? Stack Up!, this awesome new game for preschoolers is terrific because it allows you to play as a family but you are able to modify easily for each player as players can choose to stack by using their hands or by using instruments in various ways to stack up the blocks. I love that kids can build their core trunk and shoulder stability as they stack blocks AND at the same time work together to beat the villain- yeah, it's another great cooperative game. You can lose but you'll lose as a team. 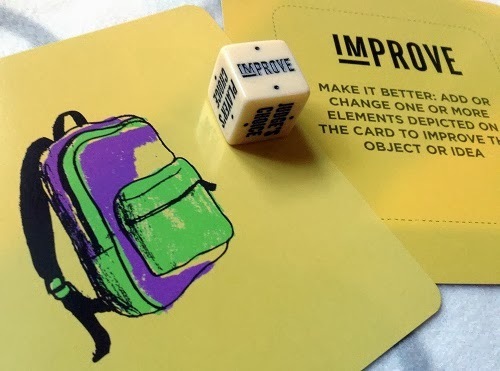 It's really smart game design because it's providing that "just-right" challenge for each child which keeps everyone interested and it so helpful to a family with children of various ages and skill sets. Tester 7 and 8's family loves Peaceable Kingdom's Cooperative Games and are now buying it as gifts. It's a go-to gift for us too! Lastly, there is an added feature where two players can stack a block together using not just their hands but rather their tools. Think that's easy? For some, possibly but for those of us who have a hard time taking another's perspective and following group expectations, this challenge can be very difficult. Think about how hard it might be for two people to hold an egg on a spoon and walk together. Being able to be in sync with others and take their perspective is a great leadership skill to me. That said, that is a skill that all cooperative games build. Sure it prevents the dreaded I-lost-meltdown, but more importantly, you can work on this social skill that is easier to teach by letting kids work it out themselves rather than telling them what to do. Stack Up! will stack up multiple skills in kids. Great gift for families and schools! Last hint, this was made by Joyce Johnson who also created another favorite of mine this year, What's It? I really really love Camelot Jr. It's not because I want to be a princess. I actually don't care for princesses that much. Rather, what I love is that there are two little characters with a goal: the prince has to build his way to the princess using spatial reasoning. (yes, you can make it vice versa- I recommend that) While a puzzle doesn't usually need a smiling face to motivate players, the colors, the design, and especially the characters take some of the pressure off being "smart" and puts more focus on just solving the problem. I firmly believe that young children know that their wits are being tested here- we must take that seriously and respect them for this endeavor. The series of 48 challenges that a child must set up to begin play (that's good executive functioning) seem to be great for an older preschooler and kindergartener. The back side of each challenge has the solution which allows a child to easily check to see if he did it correctly. (more E.F. practice) My eldest #1 Son, who is nine, was able to master it rather quickly and asked me to buy him "Camelot Sr." (There is no Sr. version) Luckily, he enjoys playing Troy Extra Muros (soldiers and fortress walls) but Camelot Jr. like its easier cousin Castle Logix are both made of gorgeous wood. 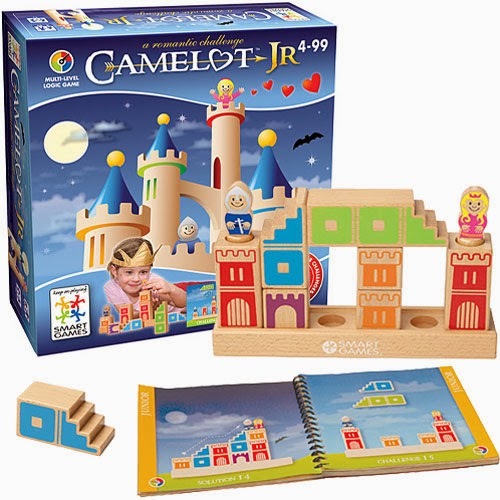 Camelot Jr. is really such a lovely gift, the puzzle holds its own just as a pretend play toy. How fun! I am in love with anything that flips out and then flips back into itself without changing the direction of movement. You don't have to go backwards to go to where you started. You always move forward but you will go nowhere. It all sounds so Zen but look at this video.... it is not completely obvious how math-y this toy is? I don't know why but I feel like I could ponder over this movement over and over again and never truly understand it. However, it is what it is - a toy. It can be for you, your child or Gramps. It is good enough to give to your principal and it is good enough to give to your nephew. You can take it apart and add more pieces, you can make a pattern between black and white. 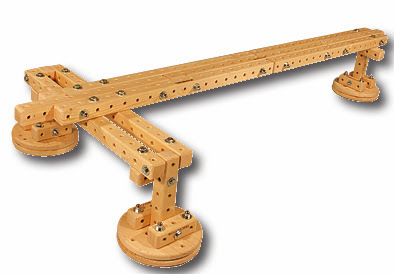 You can call it a toy or a fidget but it's really unbending evidence to me that math can be enjoyed by anyone. This is the classiest stocking stuffer you will ever find. update: 11/17/13 If you are lucky, you may be able to get the last ones available here. Email me if you have trouble buying this. I'll try to find out other places for you. Oh yeah! You can play online first- to try it out! I love that many of the pieces in this puzzle remain static but you have these variables that require your executive decision and your executive planning. 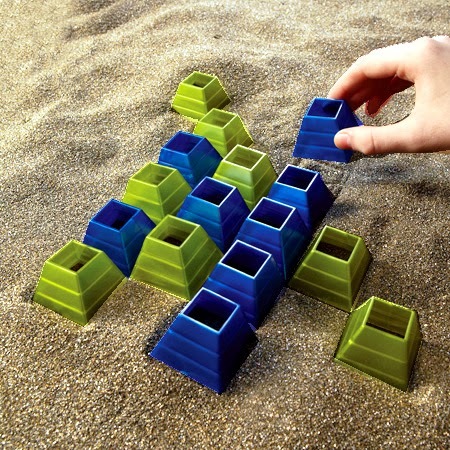 As the puzzles increase in difficulty, a player is encouraged to think things through and visualize his steps in advance. I like watching my child solving these problems with his eyes. If I look closely, I can see his eyes darting around. It's really cool. Some kids will draw an imaginary line from one mirror to another mirror and some kids will talk to themselves to work out the solution. I absolutely love watching my kids do this. It's this wonderful process of planning and self-checking that is happening here. How rewarding would it be to see that your laser made its way to the right place? 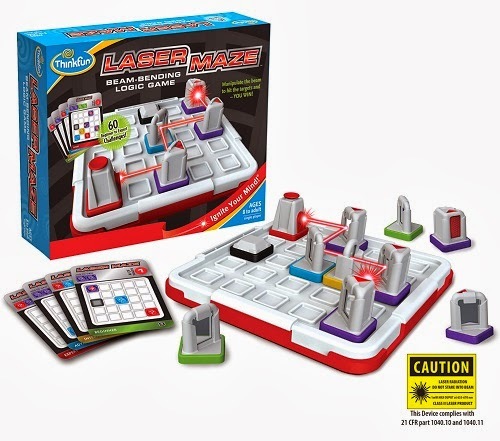 Expect a full review later with one of my favorite child development experts, Professor Jonathan Lauter at Mount Sinai School of Medicine whose initial thoughts were that he could see how Laser Maze encourages children to think several steps ahead. Isn't this what mental gymnastics is all about? Our chances of doing anything in this world are limited. Thus, planning increases our likelihood of success. 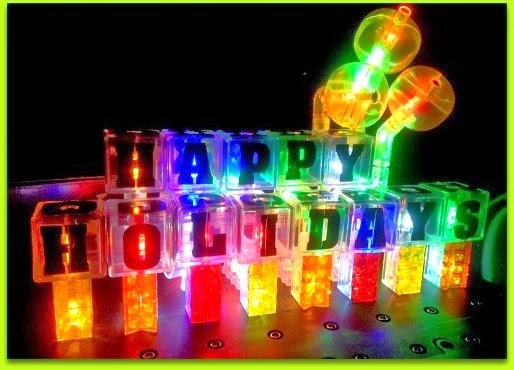 Kids can get it through play and can have a laser light show to congratulate himself. Built-in motivation! I love it! click photo to purchase through my Amazon link. Click photo for my Amazon link: The red car is clearly blocked but can you make these other pieces fit on the grid? Just blocking that car is hard enough. Click photo for my Amazon link: Road Block at left. Troy Extra Muros at right. I feel like a very fortunate person when I have time to sit next to my child and do logic puzzles with him side by side. Number 2 Son saw this game displayed at Additions, the store at the National Museum of Mathematics. He saw the cop cars, the buildings, and the Smart Games logo and that was it. It was buy or die. My kid is a huge fan of the chief designer at Smart Toys and Games, Raf Peeters. I knew this was going to be too hard for him but he insisted! Honestly, it's very hard not to buy a logic puzzle from this company. I have had to hold myself back many many many times. Some of them are just absolutely striking like their latest IQ Link. A major asset to Road Block is the theme. 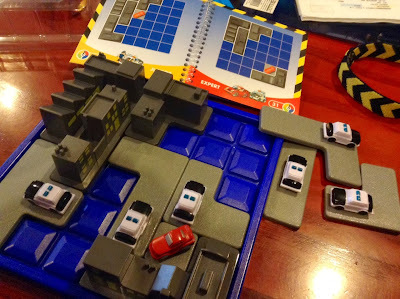 In a Gotham-like setting, police cars on differently shaped plates must be moved around to block off the getaway car. However, on a more skill-based note, Road Block is working on your ability to turn things around in your head first before you turn them with your hands. This act of visualization is important to all children, even the ones who are big concept thinkers because we are getting down to the details here. Then when the children place their pieces onto the grid, they can affirm their visualization as correct or incorrect. It's a great way to teach yourself something. Sure you can not think and just turn things only with your hands but a child will soon realize that it's not the best way to do things because you can't remember your mistakes that way. 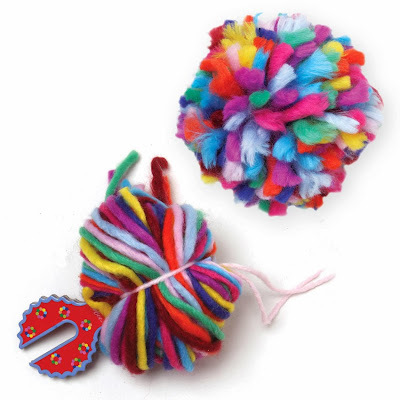 I would have never guessed that of all things, a pom-pom maker would be the best kit of the year. But it is because it is so simple but full of so many possibilities. First off, this is not for little children (unless they have EXCELLENT fine motor skills). Second, these make big pom poms, not little ones the size of sterile cotton balls. That said, I give it an A+ in total body coordination because there are moments that your child will need to be steady, pull tight, and concentrate. Only then will he make a big fat pom pom. My son decided that they should have eyes. 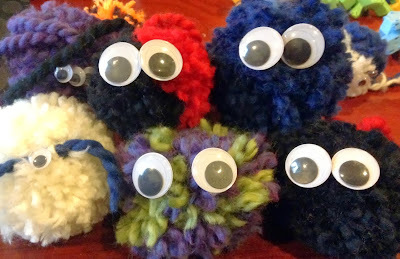 And now all of our pom poms have eyes. Beware, you can get carried away. I think I purchased over fifty dollars worth of yarn to make more pom poms however I could never find any yarn as great as the one that came in eeBoo's package. eeBoo really does make the finest things and hence, they make excellent gifts. Click here for my Amazon link: The lady with the pretty hair is my sons' tutor. She loves Jeepers Peepers and uses it in her tutoring session to boost up expressive language skills. I know there are lesser-priced alternatives out there but having owned such games and being able to compare it with this game, I am telling you now, if you want to be serious about having fun and souping up those language skills, get Jeepers Peepers. The silliness comes out in those glasses, there is no way you can look cool in them. Everyone, adults included look like goof-balls. That said, this game can become tough on certain children like my number 1. He can see how something relates to everything which is his gift and curse because it makes for a very messy mental file cabinet. DM57FE9C and save 15% until Dec. 20th! Remember it's Free Ship over $20! Yeah! Of equal importance to the silliness of the glasses are the cue cards. 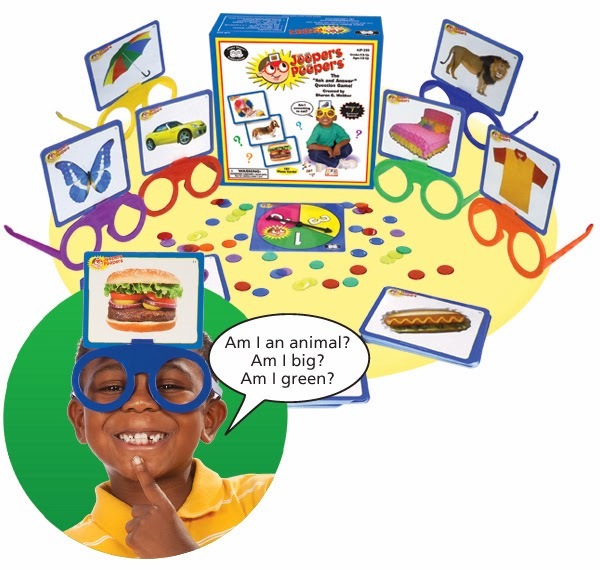 Instead of using specific questions written out on a cue card, Jeepers Peepers' cue cards have pictures to symbolize the word categories of which our minds would normally use as the folders in our mental filing system. The trick is to become more and more articulate and fluent about using these categories and for some kids, this is not easy. By the way, why do I sound like I know what I'm talking about when I'm not a speech and language pathologist? Well, it's simply because Nicole Kolenda, who has taught at prestigious institutions such as Columbia and NYU, has taught me so much and was the person to plant the Jeepers Peepers idea in my head when I talked to her about expressive language. Stay tuned to Toys Are Tools for more from Nicole as soon, I'll be talking about selfish gifting for the holidays. You are going to want to buy these selfish gifts. I promise! This size plate is harder to get. You can usually find something like this in a set. I want to say that I have come to appreciate LEGO bricks a whole lot more this year. We've found a way to buy them cheaper and to get the pieces we really want. Still, I can't help but think that when you are serious about building, one must explore different mediums. 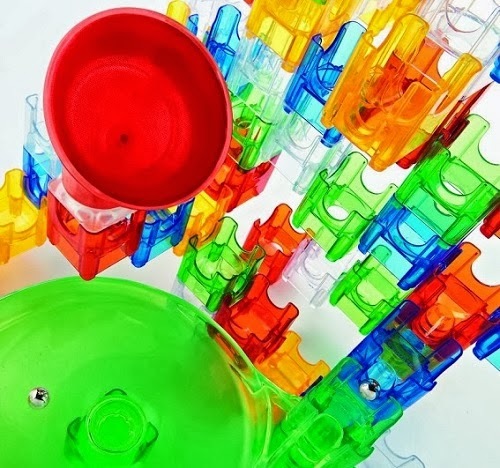 Whether it's clay, wood, or other plastic toys, it is entirely helpful to them to remain flexible and that can be achieved with other building toys that are equally riveting and yet completely different. UPDATE: 1/1/14 Most Voted as Reader's Favorite is Q-BA Maze 2.0 Mega Stunt Set !!!! 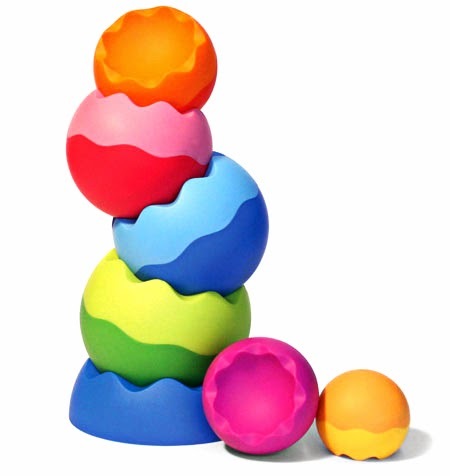 With the introduction of the Q-BA Maze 2.0 Mega Stunt Set and Stunt Add-on pieces such as Zoom and Bounce, one of my favorite building toys has now sharpened its teeth. 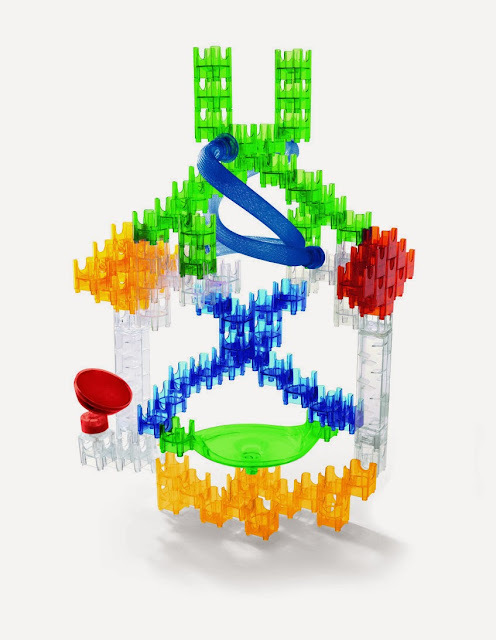 The stunt set gives you the ability to harness thewonder of Rube Goldberg mazes in a 3D pixel-like format. Unlike regular Rube Goldberg contraptions, you are getting action in various places in your structure. It's rarely going in just one direction. Thus, everytime you drop the balls, you are guaranteed a different show that is still not so random. Kids love the blue tubey thing and believe me, you are going to flip when you see how strong but still so flexible it is. What a surprise all these additions are. If you have Q-BA Maze at home, you are missing out if you don't get these add-ons. There is a lot of learning through play in store for them. 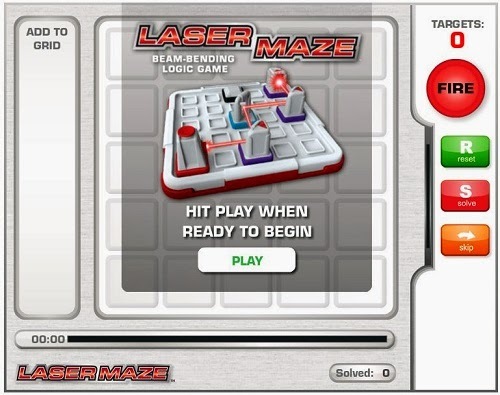 Related Toy Review: Read my full review of Q-BA Maze 2.0 Big Box here. Click Photo for my Amazon Link: The most beautiful baby toy in the world next to one of the most beautiful babies in the world, Tester #9. She just started crawling.... I think I know what could motivate more crawling. Tester #9's mom said, "She likes to knock them down as soon as I set them up, she can't wait!" Gosh, I remember those days. My kid throws something off his high chair tray, I pick it up, he throws it again, I pick it up, he does it again and then he laughs his socks off. I never meant to review baby/toddler toys' here but there have been some that I just can't resist. 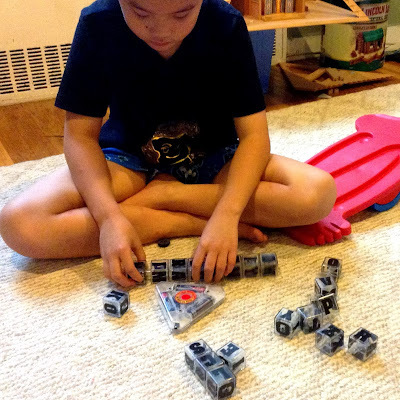 Before sending Tobbles Neo to Tester #9, my nine and six year old testers played with them for a couple of weeks. They loved it! It sat in the middle of our living room and cheered up the atmosphere. 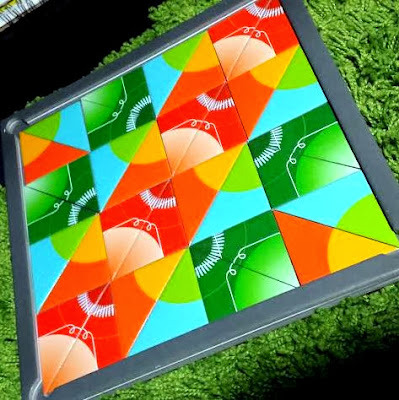 If you are like me then you were kind of sad when you realized that you could go no further with those connect-four-in-a-row type games. As you get really good, there is no a-ha moment. No- "I didn't see that coming!" And so hence, even if you are the winner, the game gets boring. Luckily someone figured out how to make connecting four in a row fun again with Kyro 5. Sure, it is harder to connect 5 pieces as you can figure out from the name. But did you know that when you run out of pieces, the game still goes on? It's like you can set up traps to trample your opponent in the afterlife. All you have to do is pick up the pieces from your playing area and just place them somewhere else. It's just GENIUS! You have to remain focused and pay attention to how the game shifts with each turn! You are always on-task, motivated, planning, it's the kind of game that you can use to teach your little ones what being a good CEO of your brain and body is all about. Yes, that is right, this is another addition to my ever-growing Executive Functioning Teaching Toolbox. And... the final plus? Kyro 5, is compact and striking. My two fave colors together in one game. It makes me happy just to look at them. This was such a popular story this year. I have to say also that my mother was also so impressed with TENZI that she also made a few TENZI gift purchases of her own. I love TENZI because it is so easy to adapt the play so that everyone who is playing can try their best. Adults will never have to throw the game to protect feelings and don't even get me started on the visual motor benefits that TENZI has to offer. I love speedy games. It's such good exercise to put yourself under small bursts of pressure once in a while. I watch my children as they play and all I can say is that they look more.... alive. Bring out TENZI to your next family gathering and see how fast you can change the mood in a room. Read my full review of TENZI here. Looks simple? Well, it's the simple things that can be so so tricky. 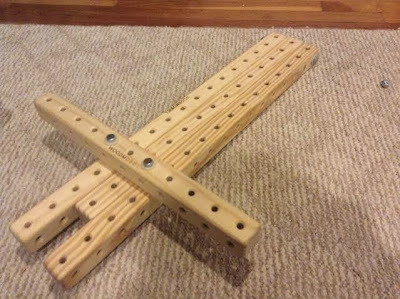 I like math toys that don't have any numbers on them. I think it's because I think spatially and love laws. There is a law that makes Twiddler what it is. It kind of reminds me of Rubik's Magic because everything you do affects more than the piece you want to move. Once you figure it out, you will find it a breeze but after you do figure it out, you must tell me. I still don't know. None of us do (although Tester #1 is getting close- hate him sometimes) Additionally, the turning aspect is very special. I think that is a great skill to have. The more accurately you are able to visualize something before you physically move it, I think that will lead to better planning skills. While we all know that planning skills are important, how well do we fare when things get confusing, when we have to plan not one but rather three steps ahead. 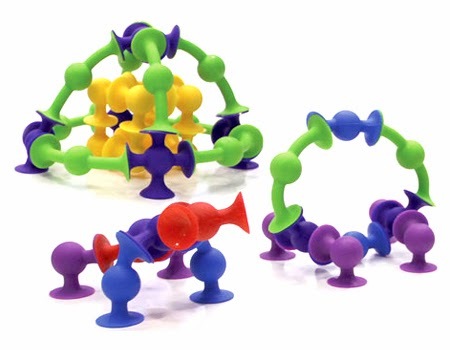 Note: Double Dilemma has more simpler pieces but watch this video to listen to the inventor, Wilfried Braun, explain how Twiddler works. Twiddler has varied level challenges to help you work your skills up gradually. If I had the time, I would be playing Twiddler all day. 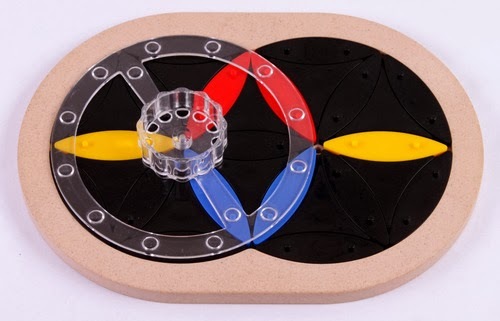 And if you are into these kind of circles, it might be because you are already a fan of Quadrilla which was made by the same inventor. Oh, one last thing, my son played this DaVinci Challenge countless times years prior which might be why he's already the best Twiddler in the house. Like I said.... I know #1 is my kid but sometimes.... ooh... I'll just keep playing Twiddler while he's at school and then one day... one day.... I will rock his world. IQ levels are not static everyone, you can bring them up if you try. Related toy review: Read my full review of Quadrilla Excellerator here. 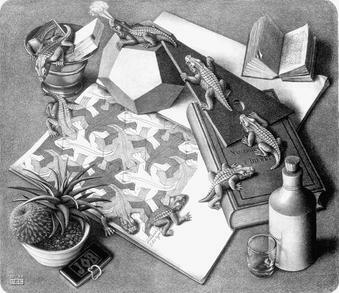 Reptiles, by M. C. Escher. Lithograph, 1943. source: Official M.C. Escher website. and then it all makes sense. Reptiles and Geometry do go together. So do lots of things and then you know that math is everywhere. You and your children may not know what the laws are or how to even apply the formulas once it's revealed to you but I think that is okay. 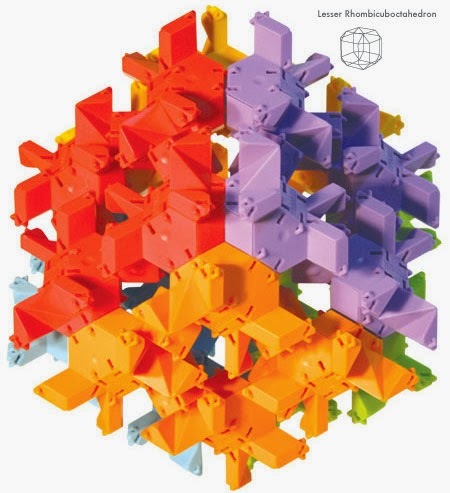 In fact I think it is really such an awesome thing to show them how fun and beautiful a dodecahedron can be way before they are tested on it in high school. Do you think that if you had a lot of stress-free exposure to a foreign language when you were little and then you would have a better chance at learning that language formally in order to graduate from high school? As a speaker of three languages with English being the only one with which I'm truly comfortable, I can tell you that previous exposure, especially stress-free exposure is oh so helpful. I recently let my six year old learn how to type (he begged, I swear- he's kind of a weird kid). But anyway, I was floored seeing him pick up the correct hand/arm position and immediately I was able to trace it back to when he had taken piano lessons for a few months. Even though it had been years since he played piano, he knew how to sit upright and hold his arms out steadily. I might be proven wrong when my kids get big and will scream if someone says isoceles triangle to them but I am betting that they won't and I'll have Fat Brain's reptiles to tell me that I was right all along. 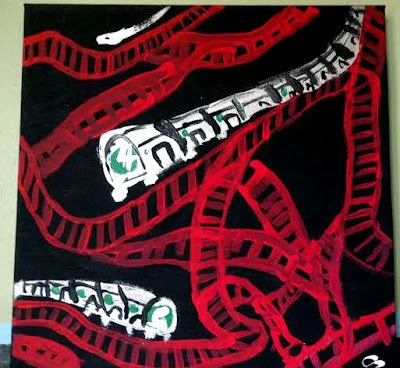 And if I'm not, that's okay.. Reptangles is amazing fun anyway. His letter blocks and his triangular power base. Stack blocks vertically to make a word. 12 blocks in the box. 4 letters per block. Seek Amazon boxed link at bottom of this post. When I go to toy stores, I usually avoid the "Educational Toy" sections. Don't you? To me it looks like an assortment of very loud, very annoying, very expensive toys of which kids figure out quickly that it has failed its objective once again- that is: You Can't Replace Teachers With Machines. This is why I find Laser Pegs so surprising since the letter blocks kind of say, "I'm an 'educational toy!'" However, it probably is saying, "I'm an educational tool!" You will figure out the difference once you open the box. There you'll see that they've given you tons of lists of words that you can create with the 12 light-up letter blocks that you get. If you are working on spelling and decoding, this could be right for you because lights do motivate! After attempting to spell the word correctly, you can turn on the light to seal the deal. No, it doesn't bleep if you spelled it wrong but I wouldn't be surprised if I heard they were working on that. No guessing to see if that word can be spelled. They give you a list and that's not even all the words you can make. One thing that I love about studying for spelling tests with Laser Pegs blocks is that you will not be able to find your letter right away (four letters per cube so you must rotate while looking). This means the child must hold onto that letter as they complete the word. 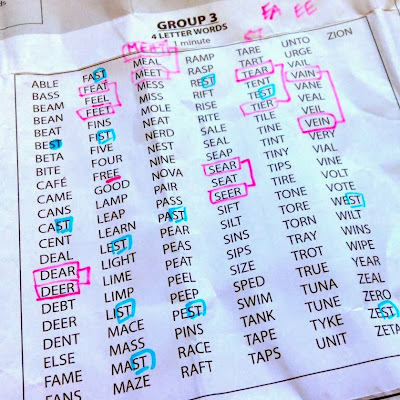 If they came across a letter that they want but can't use it just yet then they can hold it aside as not all kids are great with remembers word spellings sequentially. It's really nice to be able to watch your word grow as you build. For those of us who have working memories that need ripening, spelling words this way is a real help. 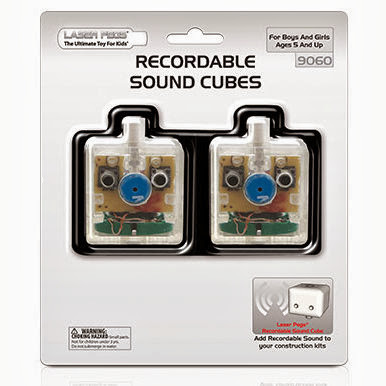 Additionally, the sound cubes can help you memorize meanings because you can talk into for for a whopping 60 seconds and then let it play back to you. You'll see that the sound is lower than most "educational toys," I consider the volume low but also very kind to my ears. And they light up too! Click photo for Amazon link. I watched the movie Thinking in Pictures starring Claire Danes and was fascinated. Not long after, I discovered that my son thought in pictures too. 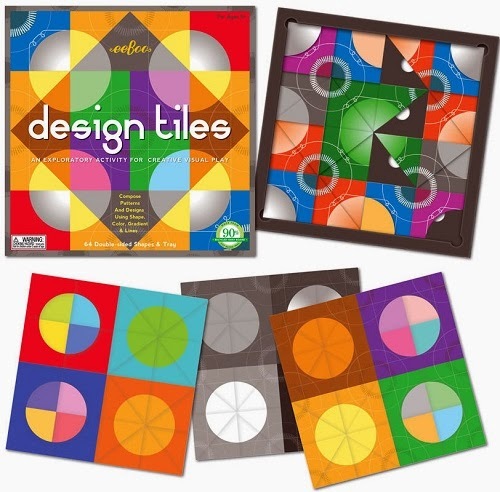 However, I don't believe I've ever conscientiously experienced his thought process until I played with Design Tiles. It's kind of amazing once you realize that you are thinking in pictures. I sense that you can think much faster when words are not in your head. Clearly, you are thinking and reasoning when you work with Design Tiles but you are able to make sense of things using just pictures. You may ask, how this is helpful to a child? Well, the first thing is.... who cares, I just got a glimpse of how my child thinks and it was fascinating! However, on a more practical level, I think that thinking visually helps us make sense of the world in a whole new way and we need that. From figuring out what to wear, how to furnish and decorate your office, to deciding on a new job or new home, there is something that always tells us yay or nay but we usually can't say why. I think this phenomenon is not far off from what Design Tiles allows you to do. Learning how to make sense without saying a word is something we should cultivate in ourselves and our kids. I am in love with these cards. I have seen plenty of sequencing cards and they just look sooooo boring. If you ever have trouble getting kids to talk, just test them by asking them direct Who, What, When, Where questions and you will really shut them up. Why... because all kids are smart enough to know that you think something is wrong with them when you do that. Why else would you be holding up cards and asking them to describe something that you can plainly see with your own eyes right there in front of you! But if you tickle their funny bone just a bit and appeal to their natural love of bright colors and silky smooth textures, then there is a chance you can help them bring their guard down. Veteran learning specialist Susan Schwartz at Friends Seminary loved the cards. "They’re so clever. 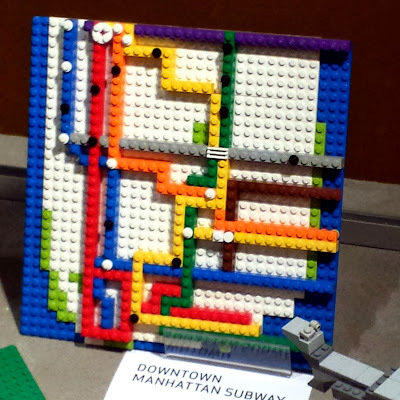 The artwork is really creative so it gives the kids really something to think about." 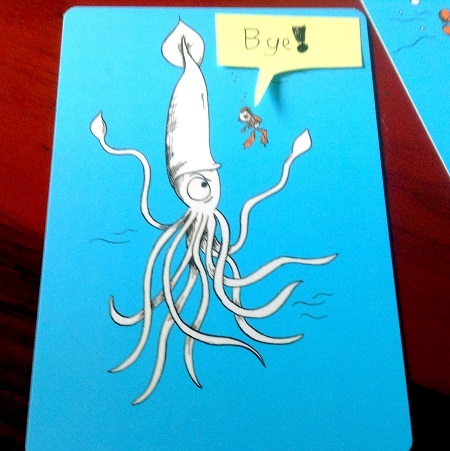 When you get that window open, usually with a chuckle, we can use these cards to work on their language skills by using imagination as the guardian of easily-bruised egos. When they trust that they won't be judged and they are motivated to be creative I believe that kids will likely start sharing their ideas and right when that happens we can be there - ready to help them refine their language skills to keep up with their creative ideas. 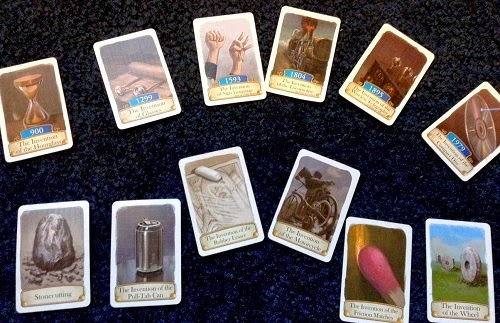 Read the full review on these fabulous cards here. Ohmigosh, this toy is soooooo fun! 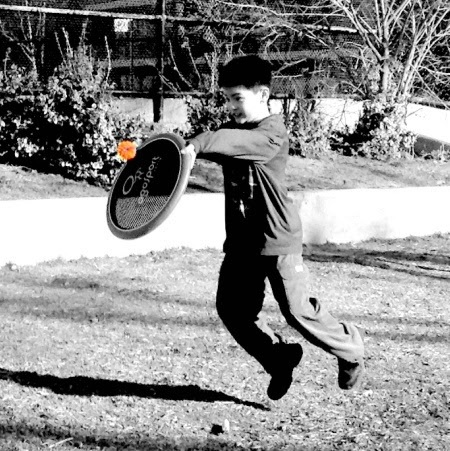 Ogo Disk are "hand trampolines for balls" as someone described them. To me, they are frisbees with pantyhose middles. (it's a lot stronger than pantyhose). I often find that the best toys are for equally great for people who are both awesome and not-so-awesome at the skills required to play the game. Isn't that weird? 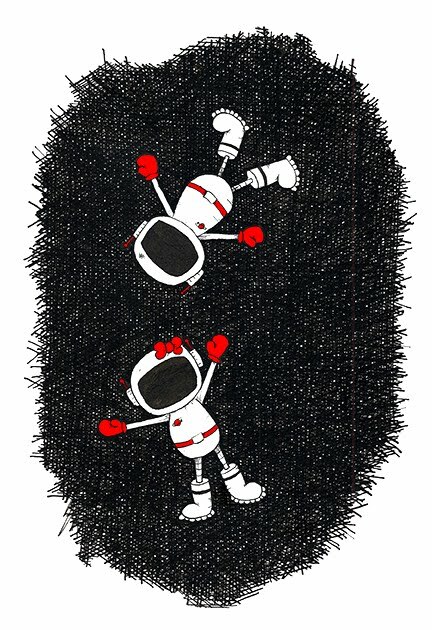 But let's think trampolines for a second.... aren't they really great for the super athletic? However, wouldn't you say they're also great for people who need to build some more muscle tone? In that same vein, Ogo Disks are just as amazing. They turn heads in the park. They attract kids to anyone fooling around with them. Their balls also make for excellent fidgets on their own and the disks can double as a super cool frisbee. Read my full review on OgoDisk here. When I first played WordARound with #1, immediately I broke out in my Smart Mommy Dance. (Sorry, no video available). 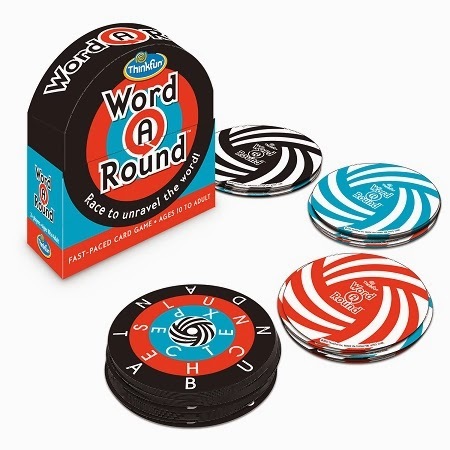 To be sure, WordARound is tricky, you have to read a word in a ring and you don't know where it begins or ends or even which direction it should be read in. 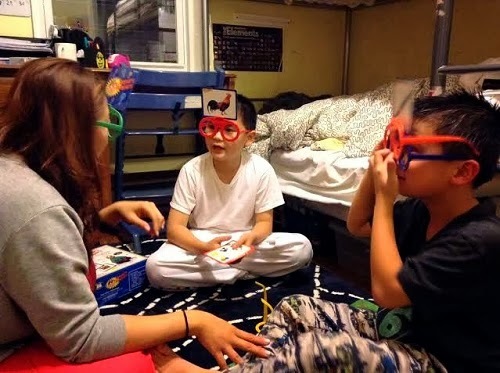 But I had this feeling that this was THE pro-reading game for #1 because it would force his eyes to move differently than usual and it was also a race against time.. Well, like all moms, I was RIGHT! But seriously what do I know? By the way, did I tell you that I have never taken a course about education or literacy in my life? It was only this year that I could even say "phonemic awareness" without spitting on myself. Still, I told ThinkFun about my theory and asked them to help me figure this out... I couldn't find much literature about this but I knew that I couldn't be the only one thinking this way. ThinkFun was kind enough to send their games to whoever I wanted and after chipping away, I found out that my question could be answered by an expert in sensory processing disorder. Such professionals understand the various way a body takes in information, by pressure, by touch, by sound, by smell, and of course by one's eyes. Karin Buitendag, the director of occupational therapy at the STAR Center (Sensory Therapies and Research Center) the treatment facility associated with the SPD Foundation, THE global authority on sensory processing challenges, seamlessly explained why he might be reading better when movement was involved. "If there's more movement, he gets better feedback," said Karin. "And that helps him to direct his focus." Karin further added that he is able to direct not just his focus but also his senses and that because of movement, his cognitive processes work more efficiently. For those of you who are in the same boat as me, all I can say is, play WordARound and let me know if you'd like to compare Smart Mommy Dances. Read my full review of WordARound here. AGE: If you're under 5, kids will need help. 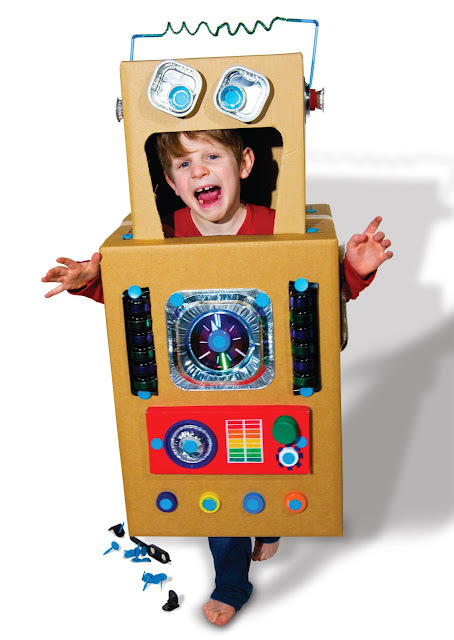 Like Woodmobiel, I wish I knew about Makedo when my kids were toddlers. At that time, their pretend play skills were emerging and that was so exciting. I wanted to give them a representation of the entire world through toys ie. toy kitchen, toy chair, toy table, toy plates... At one point, I really wanted a toy mailbox. I looked EVERYWHERE but the only one I could find that I liked cost a small fortune. Thus, we did without the mailbox and a whole bunch of other things that we couldn't afford to buy. 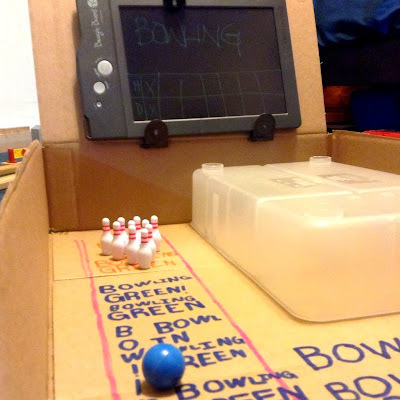 Look what we did with this very well made $4 bowling set from Toysmith. It deserved to have an alley but I wasn't about to buy one. Had we figured out that making toys could be so affordable and easy, I wonder if I would have bought half the toys we bought during those years. I will never know but the great part is that it's not too late for us. As they grow, they are requesting toys that pretty much don't exist or come in cheap plastic versions that are annoying, loud, and eat up batteries. 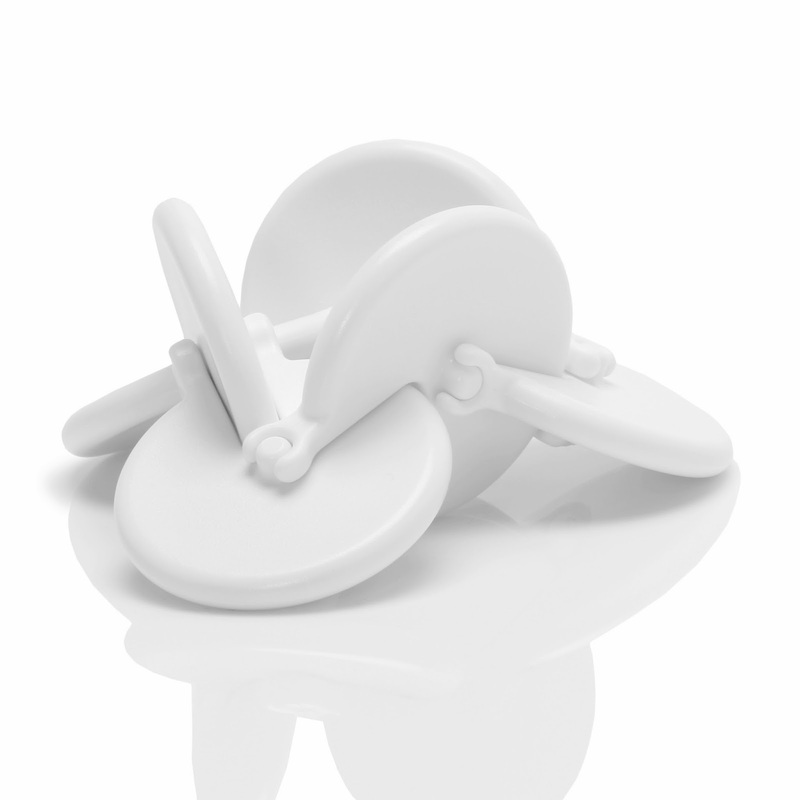 Moreover, this year, Makedo has come out with these little add-on pieces that can placed onto a box easily with something called the Scru. The ease of these pre-made pieces makes shifting into pretend play, very smooth. Thus, instead of buying a puppy or a fire truck ride-on or a big robot doll, with a little help from Makedo, you can have everything you need and money left over to go for lots of afternoon ice cream treats. That reminds me, I have to ask Makedo to create a pretend Ice Cream Truck set. How cool would that be? Ages: Box says 10+ but you can do with younger kids... possibly as young as seven. Younger kids have better and more outrageous ideas. I love it! Here's a scary story from as recent as yesterday (11/24/13)! Tester #1 got a mild concussion a couple of days ago and I decided to go back to hospital to see if he needed a CAT scan. But that's not the scary part. Since my son had a concussion, I didn't want him to watch too much T.V. or play video games. I had only grabbed a few books and forgot to pack games for him cuz you know... I have some good ones at home. So I decided to ask for some. And what do they come back with? An X-Box Controller and dozens of XBOX games. No board games. No card games. When I explained how we couldn't have video games or T.V. they said they really didn't have anything but Candy Land and a deck of playing cards. They didn't even have UNO. I cannot tell a lie: I would like to disrupt this dysfunctitution really really badly. Are you surprised? Maybe not. And that means you're thinking what I'm thinking. This is how things are going these days. It's just the way it is. But we are in a healing institution, a teaching hospital that boasts cutting edge medicine. What message is being given to my child here? We are state of the art and so we only offer you X-BOX? I can hear it now, "Mom, why can't I play X-BOX? Even the doctors gave me X-BOX!" 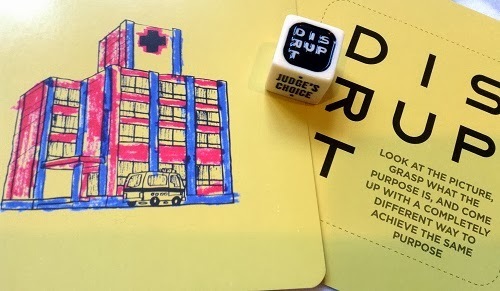 The point of my story is that when I play things like Disruptus, I am not only having tons of fun, I am also asking my son to be observant, ask questions, acknowledge his own opinion, question the dysfunctional norms and most importantly, challenge him to find a solution. 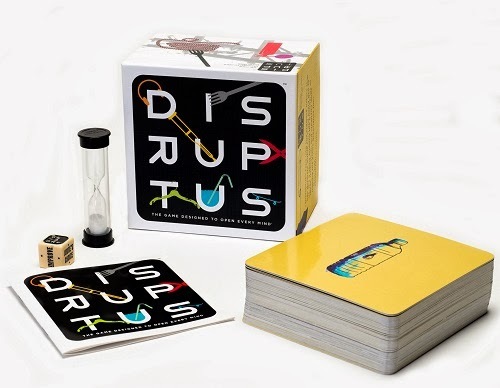 Read my full review of Disruptus here. Show them that challenges are fun. Tallying up most purchased in 2013 right now. come back soon for my findings! Win this just by voting! 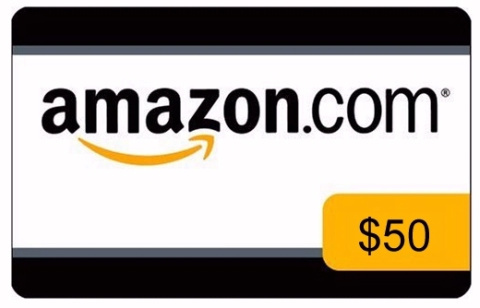 And now try to win this gift card!!! Here are some links for you if you are shopping on Amazon! Remember if you are undecided, that's okay. Just put it in your cart before logging out and you will be helping this site a great deal! Thanks! 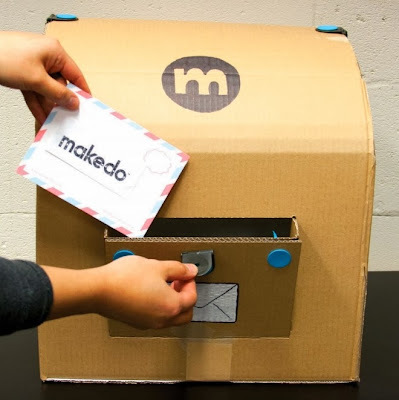 My vote would be for Makedo. So many possibilities! 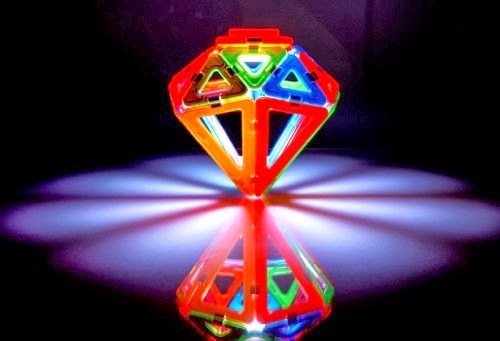 I vote for the Magformers Light Show set because I think my 4 year old grandson would spend hours playing with this toy and it would inspire his imagination and creativity. I'm going to give my vote to TENZI. My son loves dice games. And it looks like a game that my boys can play together. I also like that it can be adapted for younger players. One more plus is it's portability, so we can easily take it with us and have entertainment wherever we go. K sorry my browser kept crashing before so I didn't add detail. I just think it looks really interesting, different, and challenging. I like the kind of creative thinking it requires. Ugh having posting trouble. Tried to add detail but my comment appeared twice. Then I tried to delete the double and both got deleted! No idea what's going on. Basically I chose this because I like the creative thinking challenge. I really love the Laser Maze!! we have a great game called Sci Fi Files also by Educational insights . My 9 year old loves it! Also Sticks and Stones is another great one! I am a big fan of movement. Therefore, my vote is for OgoSport! it can even be played inside the house (well at least I'd allow it on cold cold days). Lots of great things on the list to explore. I'm wording if the rainbow loom should be on the list? I can see it as part of the "social scene" and a good "fertilizer" as kids make them for each other and trade them. 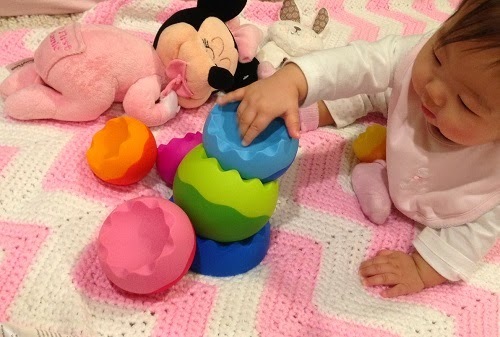 They can be form of personal expression and fine motor/coordination for sure. (Please tell me I know how to use the toolbox appropriately). I have TWO rainbow looms in this house. They will go on another list soon. I was totally thinking similar things about this. As far as appropriate use. I can only tell you how I might use a hammer or a nail but if you see that you can use the screwdriver in a different way then who is to say that is appropriate or inappropriate. If you are in a jam, the screwdriver is a scorer, a knife, a poker, a nail, a fork, a skewer, and something to unlock your bathroom door from the outside. If you are thinking about them as tools then you are being more than appropriate, you are being productive. I'm honored by your question. So many amazing options!!! 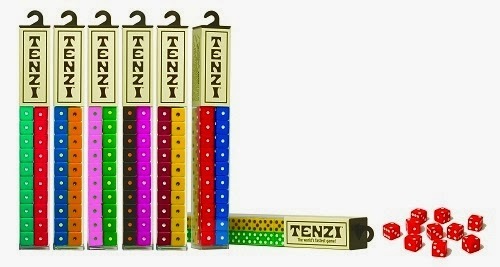 I think my favorite is the Tenzi--it looks like something I could play with my typical 5 yo and not-so-typical 8yo. It's so hard to pick a favorite! there are so many awesome toys here! But I think the one that would get the longest lasting play might be the Woodmobiel. It looks like the kids would get alot of fun with that!